The emulsion is of the type: oil in water, the monomer is oil soluble & the initiator is water-soluble & an emulsifier is used to create a stable emulsion. Apparatus can be used to generate the kinetic data for emulsion polymerization under various operating conditions like temperature, emulsifier concentration etc. The set-up is used to carry out the emulsion polymerization involving polymerization of an unsaturated monomer like Styrene. Air has to be evacuated using a vacuum pump to create vacuum up to 30mm of Hg before passing the nitrogen supply. Initiator from the reservoir is supplied to the reactor under pressure. Polymerization is carried out under the atmosphere of air free nitrogen. Metered quantity of nitrogen gas from a cylinder passes through a de-oxygenation column & allowed to enter the reactor. The set-up is complete & self-contained with sampling ports. The set-up consists of jacketed type SS reactor fitted with a variable speed agitator & baffles. Hot water from a digitally controlled water bath is circulated in the jacket using a pump. Instruments, Laboratory wares, and Chemicals required for analysis as per the system adopted. 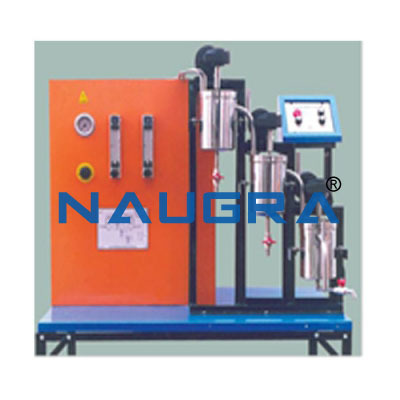 We are leading manufacturers, suppliers & exporters of Emulsion Polymerization Reactor. Contact us to get high quality designed Emulsion Polymerization Reactor for schools, colleges, universities, research labs, laboratories and various industries. We accept bulk orders for government tenders in all countries around the globe. For similar products visit at main page of Chemical Reaction.